As with any pet, and more so with a tarantula, you need to have created a permanent accommodation before you bring this arachnid home. You not only have to make something more secure but you also need to have the correct environment if you want your tarantula to thrive. First you need to have some type of temperature control because tarantulas do not like cold climates. Secondly you need to know if your tarantula is arboreal or terrestrial. The former require tall enclosures with lots of vegetations; the later need wide enclosures with flooring. There are also some species that burrow and thus you need to have lots of bedding. Today there are many types of commercial custom made homes available for pet tarantulas. If you prefer, you can use an aquarium, any type of plastic box or a large tank. At minimum the size should be 24’ x 24” x 12 “ so that your tarantula feels comfortable. If the container is too small, the tarantula will not thrive and remain small in size. However, if the place is too large, it may not be able to find its food. If you plan on having several tarantulas, the same tank can be used but the compartments must be divided and secured so that one tarantula does not ravage or destroy the other compartment. To make the floor suitable for burrowing, you need to add compost. This material also retains water and helps to maintain humidity. Over time, compost can become moldy and start to harbor mites thus, it is essential that you change the bedding regularly. Vermiculite is another option for the floor but should only be used if your tarantula is arboreal. While vermiculite is light, sterile, non-toxic and ideal for warm and humid environments that occur in the tank, the granularity is so thick that most tarantulas will not be able to burrow underneath. Most experts recommend a 50:50 mix of compost and vermiculite- this also helps eliminate mites and molding. You must avoid sand and soil, as these particles can become soggy and very heavy when wet, making it difficult for the spider to burrow underneath. Similarly, avoid wood and bark chips, as they often get moldy. In fact, some cedar chops may even emit smells that may not be safe for the spider. Finally wood chips also make it difficult for the spider to walk or jump. Accessories: Tarantulas are secretive creatures and love to hide. To that end you should provide some type of retreat, which allows it to relax and hide. You may add a small flowerpot, cork bark, or some type of plastic or real plant. These items should be placed in the darkest corner of the tank, as tarantulas do not like bright lights. The tank must be ventilated but avoid too much ventilation as it can cause drying and prevent proper molting. To add ventilation, you may drill or punch holes in the walls. If the tank has space you can add some small plants or waterfalls but do not go overboard because most tarantulas prefer to stay hidden. Plus the more junk you eat, the more labor intensive is the cleaning. Clean up of the tank is required but this does not have to be everyday. If you notice that things are getting dirty or moldy, then you need to replace the compost, plants and other features. However, any residual food at the end of the day needs to be removed as it only serves to attract mites and go moldy. By regularly cleaning you can keep the mite population down but will never completely eliminate them. 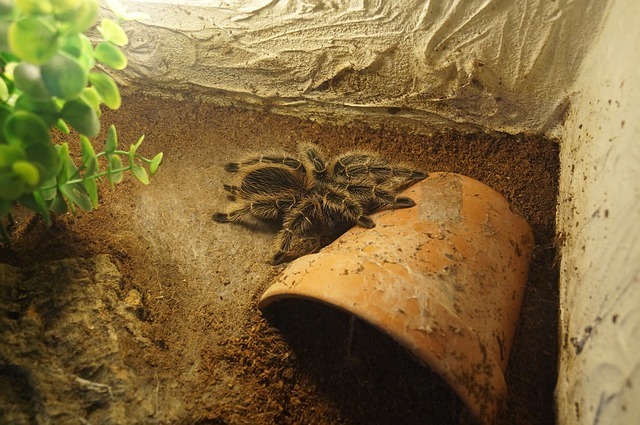 The good thing about tarantulas is that they only use one part of the tank to defecate and so your cleanup will be easy.